The city of Caravaca de la Cruz is located 60 kms nortwest of Murcia. 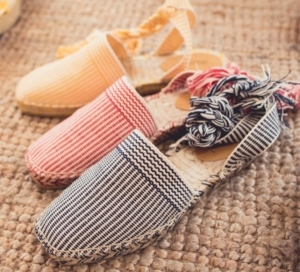 It is world-famous for its tradition of religious parades, and is also well-known as the city where espadrilles (alpargatas) have been produced for over one hundred years. It is in this city that the MAYPOL factory is based. Currently, Manolo and Maria José run the business that their great-grandfather started in the 1950’s. In the early 1990’s Manolo joined his father in the factory and created the MAYPOL brand. The business expanded steadily and now exports to more than 30 countries. Japan, Hong Kong, South Korea, Taiwan, China, Singapore and Indonesia are among those ones. More than 4.000.000 pairs have been exported during the last two decades to many prestigious retail companies throughout the world.